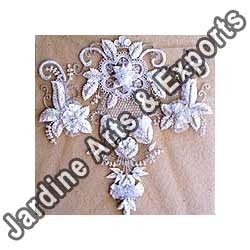 Our range of products include embroidered net fabrics, embroidered satin fabrics, hand embroidered garments, embroidered laces, embroidery accessories and embroidered lehenga saree. Beautiful sequins and beads have been expertly woven to give the shape of flowers and beautiful patterns to embroidered satin fabrics. The design has satin lace beautifully folded to give the shape of a 3d rose and sequins and beads attach each such rose by way of exquisite designs. 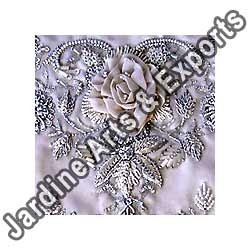 The sequins and beads used are of superior quality and have a glow that makes them all the more attractive. Looking for Embroidered Products ?